This month in my study of the elements and principles of design, I am focusing on the depiction of three-dimensional space on a two-dimensional plane. It often is not listed as an element of design but it seems to me to be very important. When we look at a picture on a two-dimensional surface visual signals can convince us that we are looking at a three-dimensional image. The paintings of the Ancient Egyptians are a good example of images with no depth. They are about as flat as they can get. Some of the tools for creating illusions of three dimensional space are overlapping, changing size and placement, linear perspective, relative hue and atmospheric perspective. For this exercise I decided to play with the size and placement of items in the picture to change the perceived depth. The photo I chose to work with is very flat looking and does not read as very deep. In Microsoft Picture It! 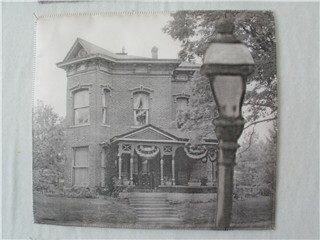 I pulled out the small lamp post in front of the house, enlarged it and replaced it in the photo. 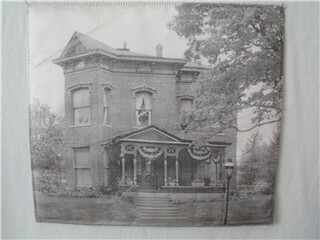 The house isn’t any bigger or closer but the front of the picture was brought closer to the viewer. So the percieved depth of the picture was increased. To further play around with the photo I applied a photo illusion that Microsoft calls accented edges, which basically just highlighted the edges of the objects in the photo. After printing the photo on fabric I colored it with Crayolas and edged it with zig-zag stitching. Not a failure, just not finished yet! A little embrodiery and embellishment to highlight and sharpen your design intentions would make this piece come totally alive. Moving the lampost forward was brilliant. The colors added are perfect to evoke that subfusc Victorian aesthetic. You are onto something really strong here! I agree that moving the lamp post was a terrific inspiration, making the viewer feel as if he is there, looking at the house, part of the scene. Love the bunting (so 4th of July) on the porch–seems to be waiting for a parade to pass by! What a good write-up on creating depth! Having the darker blacks of the lamppost in the foreground also helps achieve the depth you’re working towards. This piece has a pleasantly playful look that takes it out of the photographic realm and into artistic expression. Very nice! Artists are definitely too hard on themselves…. it is a VERY good piece and I am impressed with the technique. Your depth is very good as is the 3D effect of the building. Great work, Deb. I agree with everyone else. Moving the lampost was a smart choice, and I think you should add quilting and/or embellishment to give it more texture. This house is great and you are really onto getting the three dimensionality. Moving the lamppost was a piece of genius and I think the porch definitely shows the third dimension, it stands out from the house and indicates the volume of the inside of the porch. I think some quilting and/or embellishment will get you where you want to go. You are doing a great job with creatively expressing these elements in your series. And I love your old houses. I think you did a great job on this. Perhaps if the lamppost was a little darker, since it is in the foreground it would help with the 3D look. I think you did extremely well with the porch. I really like the approach you to took for making this piece. The piece is great, I love the way you pulled the lamp post forward. Maybe a little outline quilting & a little more coloring would give it more life, or like Alli said, a little embellishing (I’m always in favor of embellishments). I wish I were as computer smart as you are! Wow, Deb, I love this! I am so amazed at what just moving the lamp did for this picture. 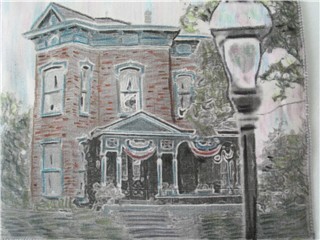 I love your coloring, its subtlety really is what “makes it…This feel like a lovely vintage watercolor to me…Great job!